It's a whirlwind of intrigue with a colossal cast on a quest for godly character. 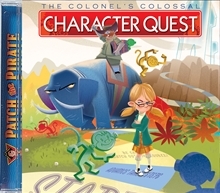 Captain Patch and the crew face a perilous test of obedience and faith as they become unwitting players in the Colonel's life-size game. Join Penelope Plum, her Uncle Ratherblather, and a barrel of mischievous monkeys as they search for Penelope's long-lost grandfather. Will the crew survive the harrowing situations in each turn they take? Teach your family leadership, patience, generosity, and endurance as you sail to this wonderful island of adventure. © MajestyTunes.com 2009. All Rights Reserved.